If you are an oily-skined gal like me, chances are you like a facial mask on a regular weekly or bi-weekly basis. I used to like to use just pure clay on my skin but as the Winter dragged and the weather is still looking too crappy to go by the sea and collected the clay, I have been experimenting with commercial masks in the past few months. Cattier Paris Ready for Use Green Clay: This is the one that ressemblesthe most the natural clay I use. I bought it in a local natural grocery store but I've seen it in Wal-Marts and Le Naturiste locations. It is also pretty cheap (around 10$ at most places I've seen it, but I got mine for 7$). Clay is a good ingredient to purify pores and get rid of the gunk inside them! Origins Clear Improvement Active Charcoal Mask: I first came across charcoal in skincare with the Lush Coalface Cleanser about 10 years ago. Granted, charcoal can be scary looking in skincare as it is black, but it is good to balance sebum and also get rid of impurities. The charcoal scent is not too pungent, I think it is because it contains myrtle leaf water, as parfum (fragrance) is not on the ingredients list. Also contains clay. The Body Shop Tea Tree Face Mask : Another mask containing clay, this time combining it with tea tre oil. This helps controlling the sebum as well as prevent blemishes. It is a great mask for summertime as tea tree as a cooling sensation and a fresh scent! Blue Lagoon Iceland Silica Mud Mask: This is the only one of the bunch not containing clay. As its name suggests, it is made out of the mud from the Icelandic Blue Lagoon, which is rich in silica. It claims to deep-cleanse and exfoliate. It comes out the tube as a white paste, but when you put it on your face it is trasnparent, which makes it difficult to apply evenly. After a few minutes, the mask dries out and sets as a chalky paste on the skin. This paste crumbles, so be careful as you'll be left with tiny flecks all around! 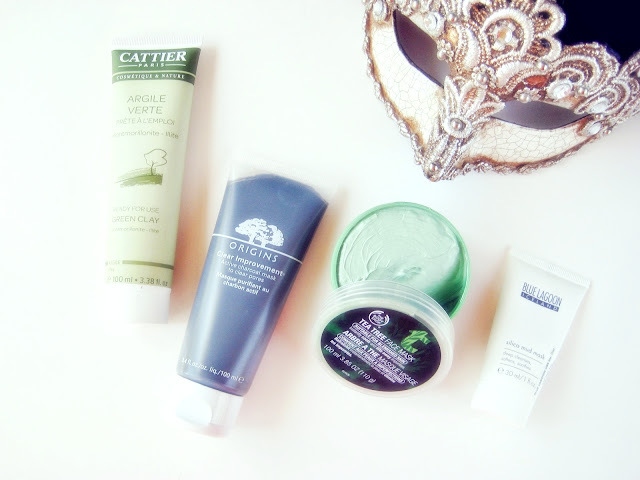 Do you have a favourite facial mask? Have you tried any of these yet? These masks look great! I am wanting to try something charcoal in the future.